Fit crust into 15x10x1-inch pan, pressing firmly into corners and sides. Fold extra crust underneath and slightly on top edges of pan; poke bottom and sides of crust with fork. Bake 7 to 8 minutes or until light golden brown; remove from oven, and cool completely. Reduce oven temperature to 325°F. Meanwhile, in 3-quart saucepan, mix 2 1/2 cups sugar, the cornstarch and salt. Stir in water, lemon peel and lemon juice until smooth. Cook and stir over medium-high heat. 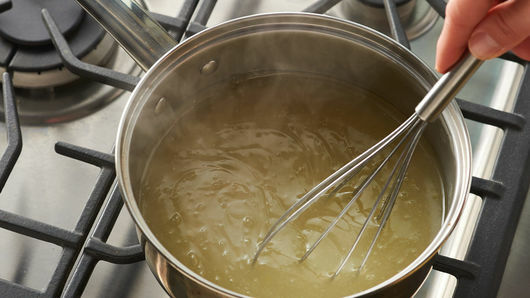 Heat to boiling; boil 1 minute, stirring constantly, until mixture is bubbly and thickened. Remove from heat. In small bowl, beat egg yolks with whisk. Gradually beat about 1/2 cup hot mixture into egg yolks. 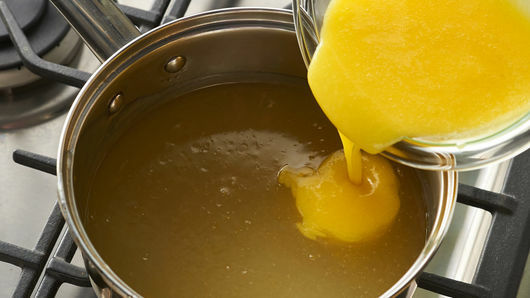 Gradually stir yolk mixture into hot mixture in saucepan. Cook over medium heat, stirring constantly, until mixture starts to gently boil. Cook 2 minutes longer, stirring constantly. Remove from heat and stir in butter; cover and keep warm. In large bowl, beat egg whites, vanilla and cream of tartar on medium speed about 1 minute or until soft peaks form. Gradually add 3/4 cup sugar, 1 tablespoon at a time, beating on high speed about 5 minutes or until stiff glossy peaks form and sugar is completely dissolved. Pour hot lemon filling into baked pie shell. 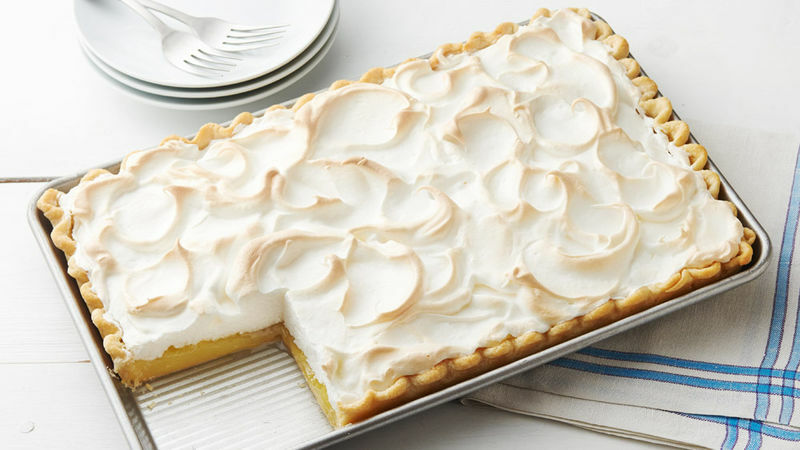 Immediately drop spoonfuls of meringue onto hot lemon filling, and carefully spread meringue to cover top completely, spreading to edge of crust to seal well and prevent shrinkage. Bake 20 to 25 minutes or until meringue is light golden brown and temperature reaches 160°F. Cool on cooling rack 1 hour. Refrigerate 3 to 4 hours or until filling is set. Store in refrigerator. Meringue can be temperamental, and results can vary based on humidity levels, drafts and temperature changes. 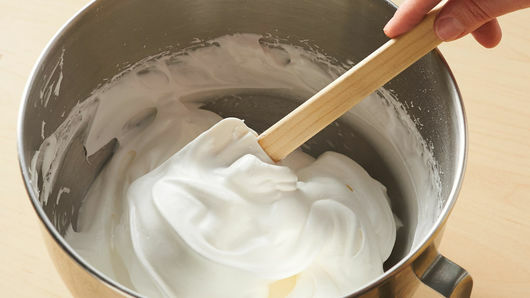 Here are some helpful tips to steer you to success: •	To know if meringue is ready for topping, rub a small amount of meringue between two fingers to see if sugar is completely dissolved. It should feel completely smooth; if not, continue to beat mixture. 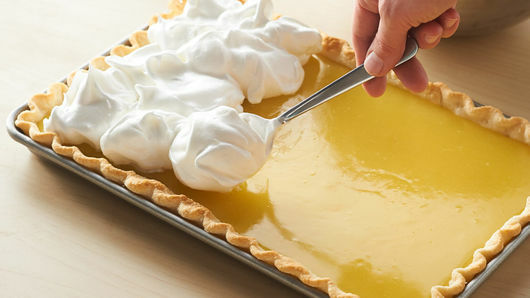 •	Meringue should be spread onto a hot filling and should come to the edges of the pie crust, making sure to seal any gaps. This is to avoid shrinkage after baking. •	After cooling, it’s not unusual for small beads of moisture to form on top of meringue. This can sometimes mean that meringue has been overcooked. •	Egg whites whip best at room temperature; for food safety reasons, limit to 30 minutes at room temperature. Make sure your egg whites are yolk-free, or your meringue may deflate. A clean glass, metal or copper bowl is best for whipping meringue. 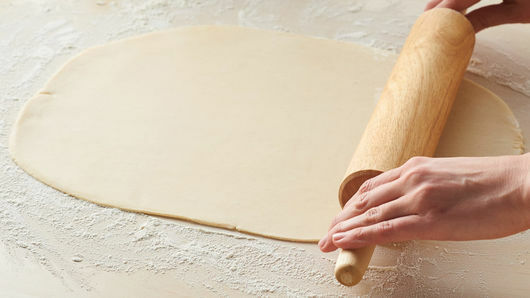 •	Before cutting into pie, dip knife into water, and do not dry it off. This helps prevent meringue from sticking to the knife.